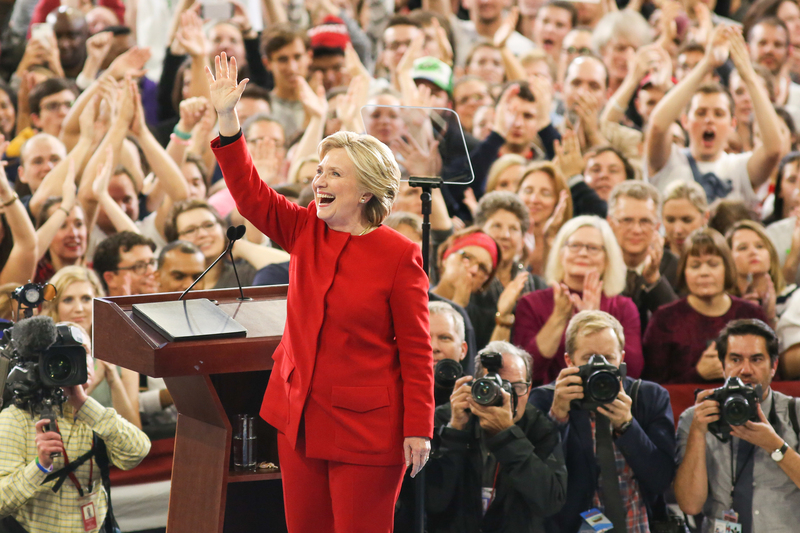 It's obvious that Hillary Clinton was already the de-facto leader of the growing movement that proudly calls itself the Clinton-inspired "Pantsuit Nation." But on Tuesday, the soon-to-be Madame President posted a heartfelt thank you note via Facebook to the women, men, and everyone in between who are casting their ballot for the first female president today. In doing so, she set the tone for what a (fingers-crossed!) Hillary Clinton presidency will sound like. As a member of the secret Facebook group Pantsuit Nation, I saw the post with my own (soon-to-be-teary) eyes. But Yahoo reporter Liz Goodwin tweeted out a screenshot of Clinton's thank you note to Pantsuit Nation for the entire country to read. Hillary for America's director of digital Jenna Lowenstein posted the message to the Facebook group Tuesday afternoon, explaining that she sent a note to Clinton to alert her about two wonderful things — women putting their "I Voted" stickers on Susan B. Anthony's grave, and the caring, supportive messages that members of Pantsuit Nation have been exchanging in the private group for weeks. Clinton was so moved that she drafted a thank you note to her supporters, and asked Lowenstein to share it with Pantsuit Nation. The letter opened with a note of appreciation for the group's name, which has taken the longtime staple of Clinton's wardrobe and turned it into an unapologetic symbol of women's empowerment. She goes on to applaud the strength, resilience, and diversity of the Pantsuit Nation. She recognizes that the group represents "the best of America: people of all backgrounds and beliefs who share a vision for a brighter future for our children, and who have each other's backs." That's who Americans really are, Clinton writes. "And tonight, we're going to prove it," she promises. Like her campaign slogan of "Stronger Together" and much of Clinton's rhetoric in the closing days of this election, the former Secretary of State's thank you letter rejects the politics of fear and division that Donald Trump has built his campaign upon. This election hasn't been easy: It's been long, hard-fought, and at times it made us question who we are as Americans. For some of you, it's been difficult to feel like you could wear your support on your sleeve -- and that's why this community has been such a special place. Your stories and photos of family members and friends are wonderful to see, but what truly warms my heart is the thousands of comments of support and love you all send to each other. I'm honored and humbled to have all of you with me, but I'm even prouder to see this community represent the best of America: people of all backgrounds and beliefs who share a vision for a brighter future for our children, and who have each other's backs. That's who we really are, and tonight, we're going to prove it. Thank you all so much for your support, your hard work, and your votes. Tonight, I hope we'll finally break through that highest, hardest glass ceiling together, and use those pantsuits for the best occasion of all -- celebrating! And although the letter is directed to supporters, it's clear that Clinton is already thinking about how to start healing the political chasm that has basically become a Hellmouth over the past 16 months. Her letter focuses on teamwork, stressing that she cannot break "that highest, hardest glass ceiling" alone. It's a welcome reprieve from the nonstop negativity Americans have been immersed in this election cycle, and signals an important shift in tone as Election Day comes to a close, votes are tallied, and winners are declared. And for anyone still undecided, just think about who you'd rather listen to for the next four years: This lifelong public servant who wants to write love notes to the nation like America's favorite grandmother, or a race-baiting, xenophobic, fascist demagogue who can't be trusted with his own Twitter account.